Zahra Rahnavard, Iranian opposition figure, was attacked by a group of plainclothes forces of the Islamic Republic on the streets of Tehran. Kaleme website reports that the attack occurred a few nights ago in an alley close to her residence. 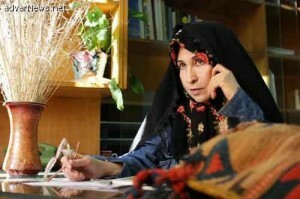 The report notes that Rahnavard was surrounded by her attackers and interrogated about her activities during the Revolution and her commitment to religion. The identities of the attackers remain unknown and no government body has taken responsibility for the attack so far. Zahra Rahnavard, a professor at Tehran University of Fine Arts, is the wife of Mahmoud Ahmadinejad challenger, MirHosein Mousavi. Her activities and statements in defence of women’s rights have made her the target of repeated attacks from Iran’s pro-government forces in the past year.